For international fans, it will be available on YesAsia & Gmarket later this month. Since his debut in 2004, Lee Seung Gi has become one of Korea’s most influential singers with numerous hits. 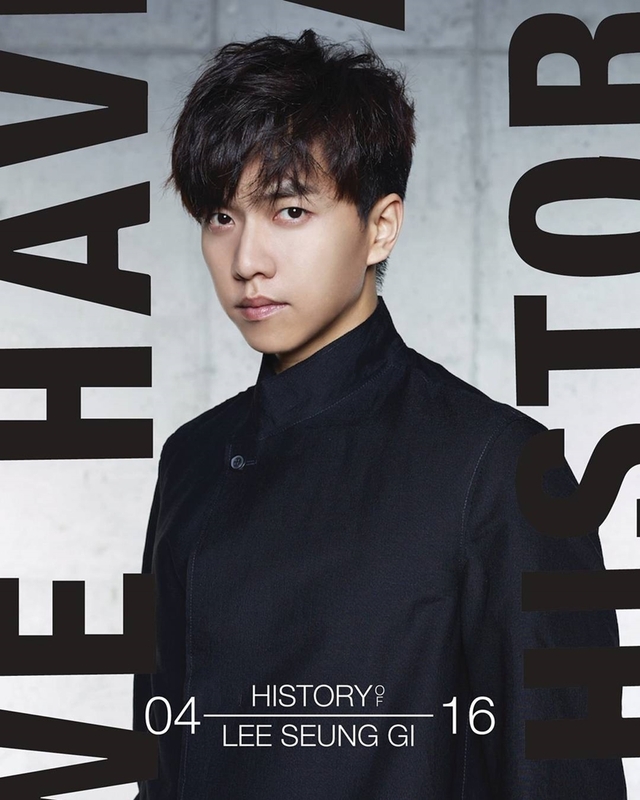 Look back at The History of Lee Seung Gi in this special collection which features 24 of the all-round singer’s popular songs, including the debut number “Because You’re My Girl,” “Let’s Break Up,” “Return” and “Forest.” The previously released digital singles “I’m Going to the Military” and “Meet Someone Like Me” are also on the tracklist. This edition comes as a USB and includes a photo diary and a photobook. This entry was posted in Music, Photo and tagged 이승기, Lee Seung Gi. Bookmark the permalink. gotta treat myself for the most special Valentine gift ever! can’t wait! Yes! I’m very happy! !! Many thanks very much because I feel it is a very chec Valentine’s gift, thank tryp! OMG! Post Valentine gift from our Seunggi 😍 Pretty sure that headsets will be my best friend 😁 I miss him more.. This album cover of Seunggiyah kinda reminds me of Japanese animes ala Ghost Fighter. 😀 cool! I’m assuming the photo book will contain all new photos like the above cover (never seen it before) and no recycled ones correct? The very song.. which hit billboards and secured you the Best Newcomer Award. But they are also songs which truly transcend across and beyond borders. And surpass yourself in your ability thus earning the title ‘Triple Threat’ entertainer. Will always emulate, admire and endear. Wow! That was a great piece of yours. You are really an inspired fan, D Lee 😊 He deserved to receive these kind of words. SL Lee your words are so on point! 🙂 I believe Seunggiyah would be so happy to receive such heart-warming message from you. 😀 By the way, is your surname Lee as well? Definitely, he would 😊 How I wish I also have that surname 😄 that would be nice haha. Btw, where are you from, bing? Oh..thank you, MJ. Am quite shy rather. I pray hope Seung Gi gets to read it. What a gift for all the fans will definitely buy this one!😍👍👍👍이승기 오빠 짱! Me gustaria adquirirlo!! Pero en mi pais no puedo comprar en dolares!!! It should be the same. But there are several options on Gmarket; just make sure the one you order includes a poster.